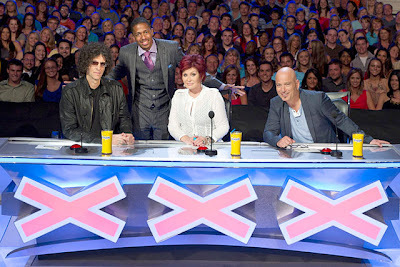 I got hooked on “AGT” last summer, when my friend Miral Kotb made it to the final four with her amazing Team Iluminate. She didn’t win (although she should have! ), but the exposure was great, and since the show she has been touring the world and now her own show at Six Flags Over Georgia. If you haven’t seen the “World’s Largest Talent Show”, anyone can audition in one of several cities around the country. Those selected by the producers perform for three celebrity judges, who--at any time--can hit a big red button, which sounds a loud buzzer sound effect, fires a bunch of strobes and light cues, and lights up two big red X’s--one on the front of the judge’s desk and another large X hung over the stage. If all three judges hit their buttons, the act is stopped and a video is triggered on the large upstage video wall. Often on TV, things like this are done just with a bunch of backstage operators (lighting, sound, video, etc.) triggering their systems manually, and it gets close enough to look OK. But the AGT system seemed so tightly synchronized that I figured that it had to be show control, and I had to learn more. I contacted the excellent lighting designer, Matt Ford, and he connected me with the main button system operator, Keith Vander Meiden. “I work at CBS Television City (TVC) In Hollywood, California. I am a stagehand there and work many different shows, usually as an electrician doing lighting. TVC has long been involved in game shows and has a division called the Electronics Shop, which designs and builds games and controllers for shows around the world. I have helped in the Electronics Shop from time to time, so when America's Got Talent (AGT) was preparing to do auditions on the road at the beginning of season three, I was asked to go with them. I controlled the three large X's over the stage and X's and lights on the Judges Desk. As the show grew and changed what I controlled changed as well. I did this until the show moved to New Jersey in season seven for the live shows. Thanks to Mr. Vander Meiden for sharing details on this show control technology used on such a fun live show!